For rustic charm that works equally well for traditional homes as for more modern abodes, the Lancaster window box planter is your best bet. It features a distressed pewter finish combined with a simple but chic design that enhances your home's beauty without taking away from your existing decor. Display beautiful flowers or vines, or keep edible plants close to your back door. It's easy thanks to this planter's various bracket options. Mount to the window, patio railing, or right onto the wall. Mix and match various sizes for a unique configuration, or go with a more uniform and tailored look with matching planters along each window. Made from fiberglass, this flower box is as durable as it is attractive. 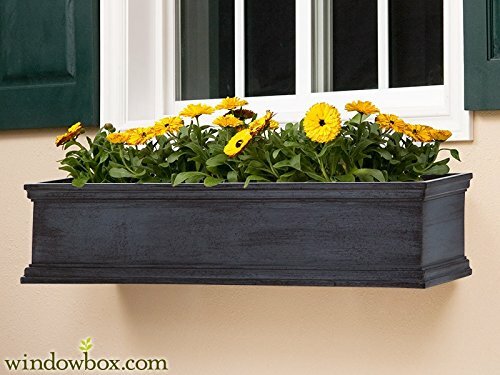 Since it won't rot or warp like wooden planters, it maintains its looks over time, even in areas with harsh weather.Each shipment includes the window box of your choice along with stainless steel wall brackets & built-in cleat mounting system.